I have been running a FlightAware / FlightRadar24 ADS-B feeder for almost 4 years now. It is an older Raspberry Pi B with a RTL-SDR stick running dump1090 at its core. These days it is mounted in my garage with the antenna on the roof. When I built it I stuffed a Honeywell HIH6130 temperature and humidity sensor in the enclosure. At the time it was mounted on a fence in my back yard so it would be in full sun for much of the day so I hooked it up to Icinga to alert me if it ever got too hot or too wet inside. Lately I've been investigating ways to get more information into a central location for my infrastructure as a whole. I have a lot of one-off, largely custom built systems to collect and aggregate system status data. While this has worked for the last 12 years, it is most certainly starting to show its age. At the moment I'm working with a stack that includes collectd, InfluxDB, and Grafana. The latter two run as Docker containers, while the former is deployed by Puppet to all my physical and virtual hosts. 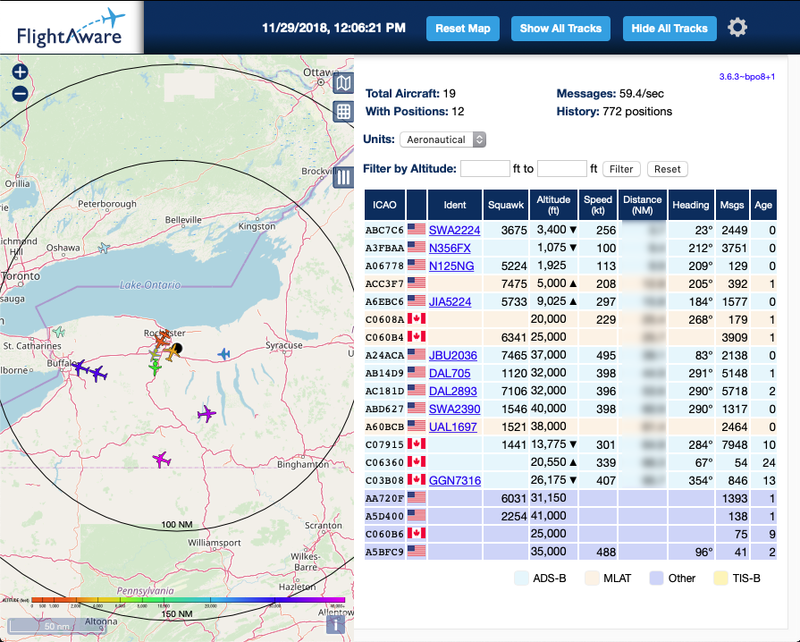 I wanted to pull together some additional monitoring information from the ADS-B feeder to see just how far I can go with this setup. Luckily the dump1090 web interface works by reading JSON files from the receiver daemon, so all the interesting statistics are available on disk to read. I was able to pull together a quick python script that loads the JSON and emits the statistics to collectd (which forwards them onto InfluxDB for Grafana to work with). I need to get the script into git somewhere but for now, here is the currently running copy. USE OF THIS SOFTWARE, EVEN IF ADVISED OF THE POSSIBILITY OF SUCH DAMAGE. 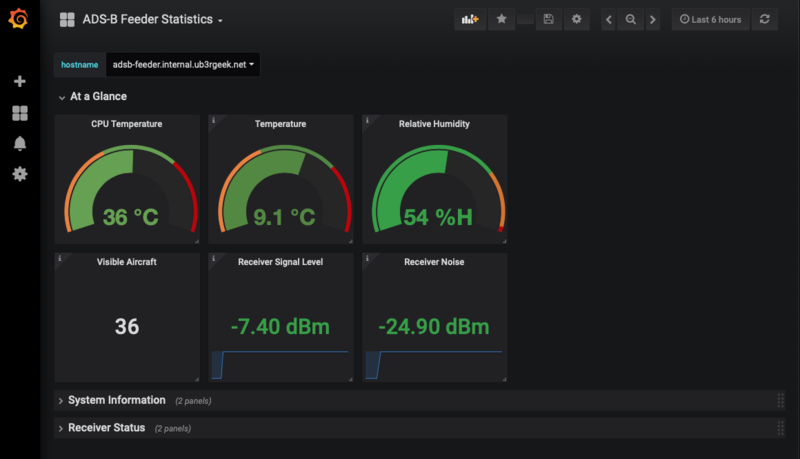 I also wanted to pull the temperature / humidity sensor readings, that ended up being a similarly easy task since I already had written a script for Icinga to use. A quick modification to the script to emit the values in the way that collectd wants and that was flowing in. I created a user for the i2c group so the script can use the i2c interface on the Raspberry Pi. The script currently looks like this. # writing the device id to the bus triggers a measurement request. # 36.65mS but roll up to 50 to be sure. # bits 8,7 of the first byte received are the status bits. The collectd plugin configuration is pretty easy, the dump1090 files are readable by nogroup so you can execute that script as nobody. As I said I made an i2c user that was member of the i2c group so the Python SMBus module can communicate with the sensor. 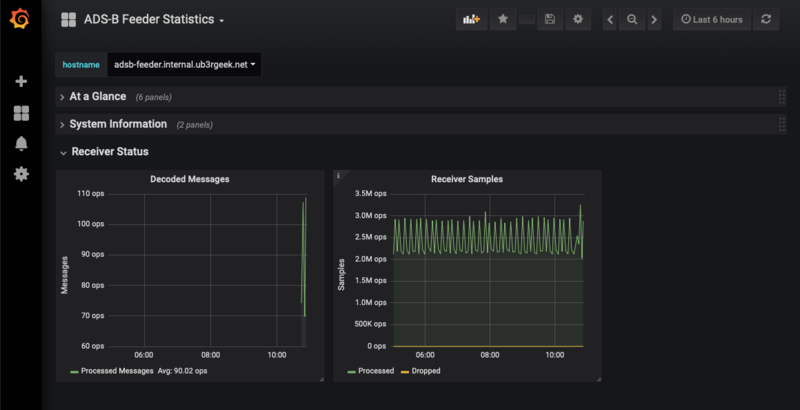 Once the statistics were flowing into InfluxDB, it was just a matter of putting together a dashboard in Grafana. 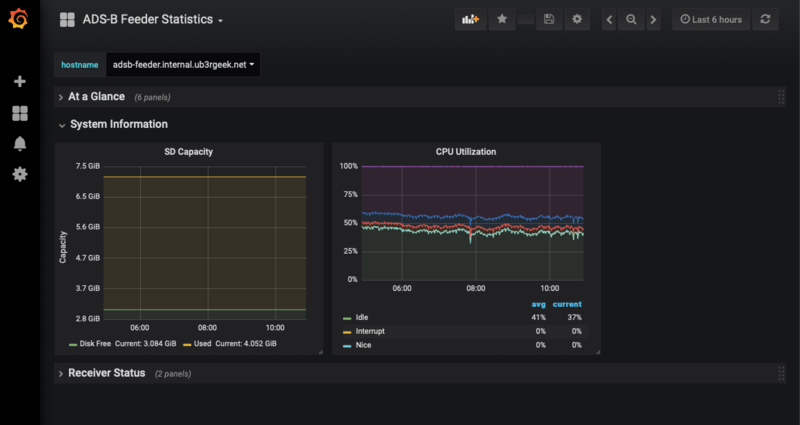 The JSON from Grafana for the dashboard is here, though it may require some tweaking to work for you. So far I'm pretty happy with the way this all went together. I still have a bunch of network equipment that I'd like to bring over and a stack of ancient MRTG graphs to replace. Hopefully it will be a similarly simple experience.